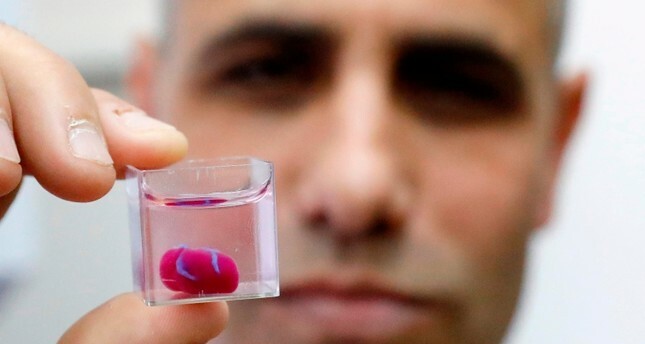 Scientists in Israel on Monday unveiled a 3D print of a heart with human tissue and vessels, calling it a first and a “major medical breakthrough” that advances possibilities for transplants. Dvir stressed the importance of the heart’s being made with a patient’s own cells and biological materials in order to eliminate the risk of implant rejection. The next step for the researchers is to culture the printed hearts in a laboratory and “teach them” to behave like hearts. “The cells need to form a pumping ability; they can currently contract, but we need them to work together,” Dvir explained. “Larger human hearts require the same technology,” Dvir said. The World Heath Organization said last year that ischaemic heart disease and stroke were the world’s biggest killers.